Rochester, NY, Aperture Inc., 1962, First Edition. Stapled Printed Wrappers, 8vo, 42pp, 30 duotone illustrations + rear cover. Designed by Frederick Sommer. In a protective clear acetate dustwrapper. 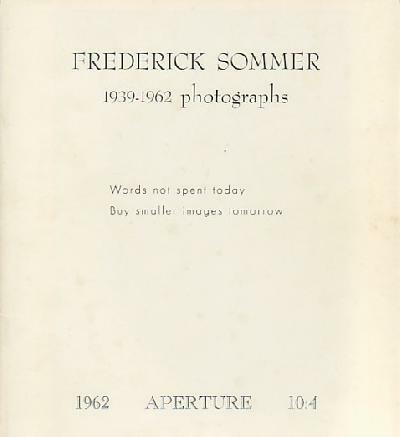 This fortieth installment of Aperture from 1962 is designed and edited by, and devoted entirely to the writings and images of Frederick Sommer. The very first monograph on his work, it contains a portfolio of twenty-nine beautifully reproduced full page photographs by the venerable late American proponent of the Surrealist image. An internally bright, most handsome example of this surprisingly uncommon item (cited on pages 162-163 of "The Book of 101 Books") showing some faint spotting to the glossy white surface of the front cover. It has been priced accordingly. PLEASE NOTE: Additional shipping costs are required for this item beyond our standard rates due to its value - we will inform you of the applicable amount at time of purchase.. Very Good -. Rochester, NY, Aperture Inc., 1965, First Edition. Stapled Pictorial Wrappers, 8vo, 40pp, profusely illustrated in b&w. This is the forty-seventh installment of Minor White's venerable photography journal "Aperture". 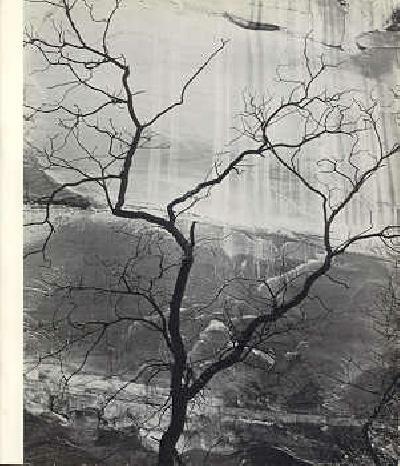 The cover images are by Marie Cosindas and Paul Caponigro, with portfolios by John Brook and Edmund Teske (twenty images), and interior plates by Minor White, Charles Harbutt, and Joan Miro. A most presentable copy showing just a bit of overall light wear and age-toning along the spine of the wrappers along with a diagonal soft crease through a portion of the front cover. It has been priced accordingly.. Good +. Rochester, NY, Aperture Inc., 1959, First Edition. Stapled Pictorial Wrappers, 8vo, 40pp, profusely illustrated in b&w. This is the twenty-seventh installment of Minor White's venerable photography journal "Aperture". The cover images are by Brett Weston and Nicholas Dean, the portfolios by Alfred Monner and Ruth Bernhard, with additional plates by Aaron Siskind and Imogen Cunningham. A bright, most handsome copy showing just a bit of light wear and soiling to the rear cover.. Near Fine. Rochester, NY, Aperture Inc., 1959, First Edition. Stapled Pictorial Wrappers, 8vo, 40pp, profusely illustrated in b&w. This is the twenty-seventh installment of Minor White's venerable photography journal "Aperture". The cover images are by Brett Weston and Nicholas Dean, the portfolios by Alfred Monner and Ruth Bernhard, with additional plates by Aaron Siskind and Imogen Cunningham. A most presentable copy showing a slight dent to the crown of the spine along with some light wear and soiling to the covers. It has been priced accordingly.. Very Good -.